Image: a cleft with the walls covered by dogtooth spars. Open: 07-SEP to 26-MAY daily 8-16:30. 27-MAY to 11-JUN daily 8:30-17:30. 12-JUN to 20-AUG daily 8-19:30. 21-AUG to 05-SEP daily 8-18. 06-SEP to DEC daily 8-16:30. Fee: Scenic Tour: Adults USD 8, Children (6-16) USD 4, Children (-6) free. Jewel Cave Discovery: Adults USD 4, Children (6-16) USD 2, Children (-6) free. Spelunking Tour: Adults USD 4. Bibliography: Herbert Conn, Jan Conn (1977): The Jewel Cave Adventure; Fifty Miles of Discovery Under South Dakota, Illus., 244pp, pb. Art Palmer (1995): Jewel Cave - A Gift From The Past, 56pp, pb. James B Thompson (ny): The Geology Of Jewel Cave, paperback, 18 pp illus., published by the Wind Cave National Park and Jewel Cave National Monument. Address: Jewel Cave National Monument, RR1, Box 60 AA, Custer, SD 57730, Tel: +1-605-637-2288 or is it +1-605-673-2288 ???? 1900 discovered by Frank and Albert Michaud, and Charles Bush hearing wind rushing through a hole in the rocks in Hell Canyon. 07-FEB-1908 Jewel Cave National Monument was established to protect the small(!) but extraordinarily beautiful cave. 1959 Herb and Jan Conn made their first expedition into Jewel Cave. Since then they have discovered and explored many additional kilometers of passages. Image: an intersection through the dogtooth spars shows us their structure. Frank and Albert Michaud, and Charles Bush discovered this cave by hearing wind rushing through a hole. They filed a mining claim on the "Jewel Lode", but they found no valuable minerals, so they tried turning the cave into a tourist attraction instead. The business was never a success, but the cave did attract attention. 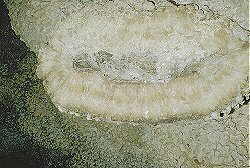 For a long time not much happened with the cave, but the then known part was destroyed by people taking away the calcite crystals. Fortunately the cave was protected by Presidential Proclamation in 1908, when it became a National Monument. This protected especially the beautiful and extraordinary new discoveries since the 1950s. Jewel Cave is the third longest cave of the world. 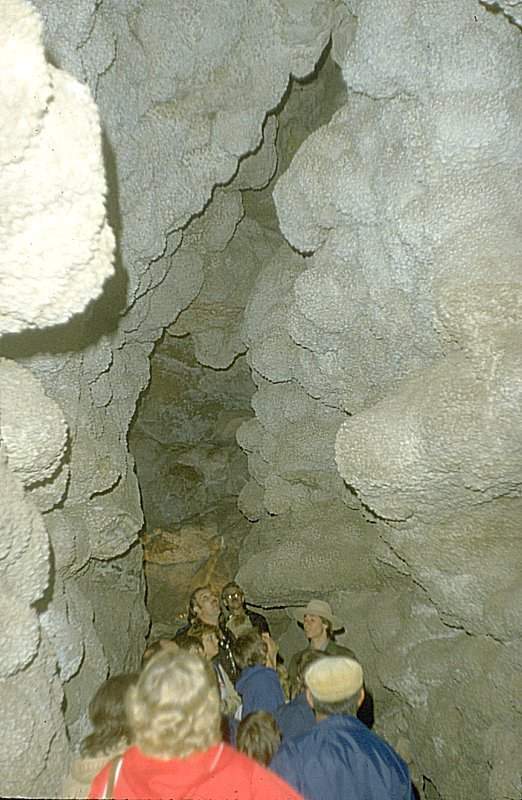 Most of this cave system was discovered and surveyed by Herb and Jan Conn, who described the story of this exploration in their book The Jewel Cave Adventure; Fifty Miles of Discovery Under South Dakota. Huge sections are connected by very narrow and difficult intersections. Jewel Cave is famous for extraordinary speleothems. Most impressive are the so-called dogtooth spars, which are huge calcite crystals covering the walls. Chambers and clefts covered whith such crystalls all over make the visitor feel like walking inside an extra large geode. 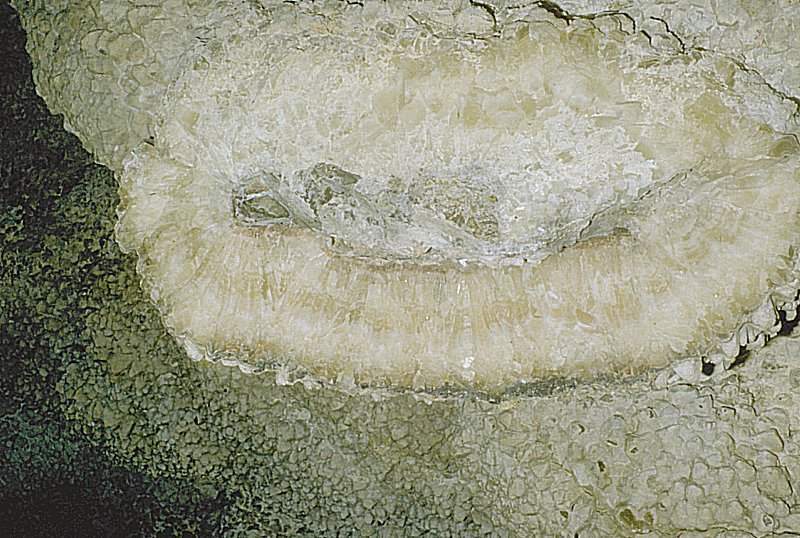 Additionally many other rare speleothems were found in Jewel Cave, like boxwork, frostwork, and hydromagnesite balloons. Todays visitors enter a part new discovered during the mid 20th century, not the one which was discovered originally. This part of the cave is entered by an elevator directly from the visitors center. The development of the paths was done very carefully to minimize the impact on the cave. The historic entrance is still used for the so-called Candlelight Tour. This tour is a bit strenuous and held only during the summer. The path is not paved, there are wooden stairs and narrow passages. Search Google for "Jewel Cave"
Jewel Cave NP, official website.